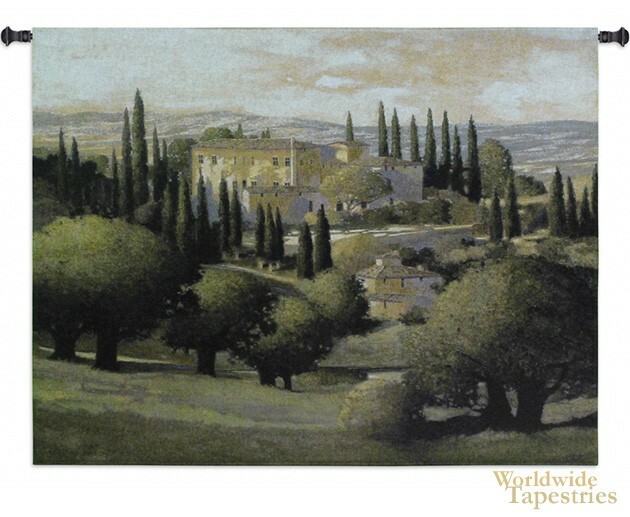 This tapestry "Warn Tuscan Sun" shows a scene of the Tuscan landscape and villa by artist Max Hayslette. In this scene we see a large villa on a hilltop with beautiful trees and hills surrounding, in a warm afternoon light. This scene is typical of the countryside of Tuscany where the idyllic climate, landscapes and years oftradition has resulted in a culture and place which is one of the most well loved in all of Europe. This Tuscan landscape tapestry "Warn Tuscan Sun" is backed with a lining and has a tunnel for easy hanging. Note: tapestry rods and tassels, where pictured, are not included in the price.